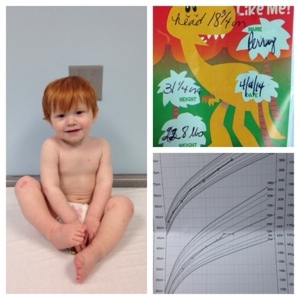 Perry had a his 15 month pediatrician well-visit bright and early Friday morning. He is getting so big. He even got to stand up on the big boy scale instead of the little baby scale. He weighs in at 22.8 lbs and is 31.25 inches tall. Right about 50%ile for both. One place that you are quite content for your child to be perfectly average. Perry did not love the whole doctors appointment experience. He cried a lot during the nurse and Dr. Ellis' exam. I think because the process was keeping him from checking out some books and toys in the exam room. Priorities, really. Dr. Ellis said he looks great. He is developmentally right on target. I could say yes to all the developmental questions except whether he could name his body parts. And that is just because we haven't spent much time working on that. Didn't know that would be on the 15 month old quiz. However Perry had a good conversation with the doctor about dogs. He is far more interested in animals and their noises than knowing the difference between a foot and a knee right now. Because he is doing so well Dr. Ellis said we could skip the 18 month appt and see him again when P is two. Yay! Then he started talking about potty training. And this mother wanted to cover her ears and say "lalalala." So not ready to start thinking about that. But will want to at some point between now and two. Then it was shot time. Perry was definitely not a fan of that...but it was over quick and we were on our way. 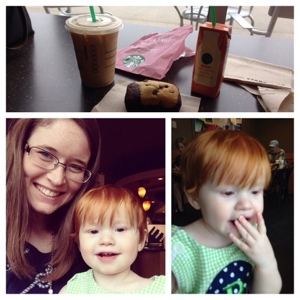 I decided Perry (and mommy) needed a treat so we stopped by Starbucks for some coffee cake and beverages (milk for the 15 month old, iced coffee for mom). After naps on Friday we got to go see Ben play his first baseball game of the season. I can't believe he is big enough to be playing coach-pitch already. He did great, swung hard and fielded some good balls. Perry enjoyed watching the kids play ball and running around the bleachers. Last year he slept in his infant carrier through most games. This year I think there will be a lot more chasing him around and goldfish bribery to keep him close by. 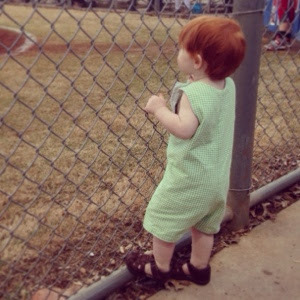 I love this picture of P clinging to the fence behind home plate watching the ball be thrown around. If his love for playing ball at this age says anything he will be out there on that field in no time.